NEW ORLEANS – April 11, 2019 – Allowing providers to capitalize on new reimbursement opportunities, MobileHelp® Healthcare, a leader in personal and enterprise healthcare technology solutions, will be showcasing its MobileHelp Touch with MobileVitals – a remote patient monitoring (RPM) solution with integrated emergency response capabilities – in its booth (#1602) at ATA 2019. Designed to provide patients with an easy-to-use RPM solution as well as the ability to access emergency help if needed, the MobileHelp Touch seamlessly fits into a variety of care models and allows providers to be reimbursed monthly by the new RPM CPT code 99454, as well as for more traditional short episodes of care. 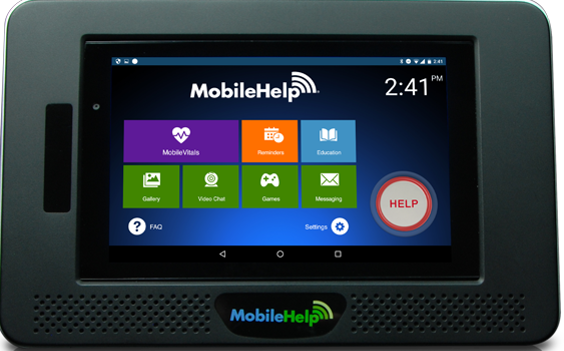 In addition to its traditional telehealth capabilities, the MobileHelp platform offers patients the opportunity to keep the tablet and peripheral equipment and continue monitoring their own vital signs following clinical care episodes, enhancing long-term patient engagement. MobileHelp Healthcare will be showcasing the MobileHelp Touch with MobileVitals throughout ATA 2019; for more information or to make an appointment with onsite executives, please visit us at booth #1602 or visit our company website.